What can I use to reach inside to clean my bathtub without straining and hurting my back? Anything with a long handle, etc. Just buy one of those mops with a sponge on it at dollar tree and, mix 1/4 cup comet cleanser and enough water to make it liquid stir and pour it in a spray bottle. Spray shower with liquid comet after shaking well. While sitting on side of tube scrub shower walls from your sitting position. I have to clean my toilet like that too. I'm having a rough pregnancy so I've had to get creative. Luckily my bathroom is small. Several of what I call "junk" catalogs have long handled tub cleaners. Some are like a scrub brush with a long handle, and some have a sponge like pad with a long handle. I don't know how I got on the mailing list for all of these junk catalogs, but I seem to get them regularly. 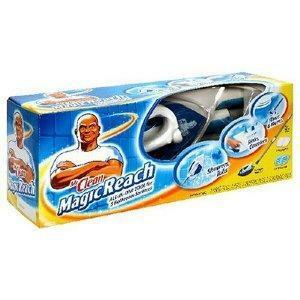 Mr. Clean makes a product called, I believe, Magic Reach. But it is great. It comes with a long, sturdy handle that is removable. The pad is shaped like a football. The pads that go on it are thick and textured to do the scrubbing for you. They stay on the pad firmly. There are 2 types of disposable pads. One is dry, which you add water to to activate the detergent, for cleaning the tub, shower, sink, counters, and toilet. The other is premoistened and is used for mopping the floor. All in one tool, you can clean the entire bathroom! It is a miracle tool and it's not that expensive. Unfortunately, mine got lost in a move a couple years ago. I am not sure where you can purchase the starter kit locally, but do an online search for Magic Reach Starter Kit. Find a soft floor broom with the right length handle for you. It will also work for scrubbing in the shower recess floor & walls as well. Otherwise, try buying a toilet brush especially for cleaning the shower & bath. I have a physical problem & have found this most helpful over the years when I can't bend at all. Where can I get this at ? I have used a plastic floor broom for years. It works. I use a wet sponge mop with comet sprinkled on it to clean our garden tub & large shower stall. I use a back brush. It has a long handle. Mine has the same type netting that the popular bath gel sponges have. It works great after I spray the tub with Krud Kutter. Got the brush at Walmart and the Krud Kutter at Lowes and Sherwin Williams paint store. I use an old swiffer mop with a bar towel wrapped around the mop end. It works fine, and is FREE! I just get in the tub and wash everything while I am taking a shower. That way, every thing is in reach, and in the summer, you can use cool water for a refreshing treat!! Buy a sponge or rag mop. Cut the handle to your desired length and then sand the end. I'm a guy, 58, materials scientist who hates dirty tubs. My solution? Use a detergent (don't grimace). Detergent just means a compound that keeps 'dirt' in suspension so the solvent (water) can wash it away. Did you know that Dove bar soap is a detergent product? If you'll put a squirt of what I use, a non-scented, no-dye, laundry (1) detergent into your bath water you won't have a ring to clean. Seriously. It should not dry your skin if used the way I suggest because it will be busy and used up keeping the soap scum in suspension for the drain to take away. This is really simple. I explain it in lots of detail. Don't get bogged down. Just take care to understand why I think it's important. Your scalp makes good oils for strong hair. As a 2 year experiment I grew my hair in a pony tail and used only liquid detergent, as above, (Purex or All). At the end I cut off my very long hair to be donated for cancer patient wigs. I experimented with detergent liquids for shampooing and came up with a plan. Detergents clean fast and completely. Just enough is the amount to use. 1. Knowing scalp oil is good for hair I did not wash my hair as often as I used to. Instead I brushed it several times a day with a brush strong enough to get to the scalp and move oil to the hair. Some might want to use two types of brushes knowing, now, how this is supposed to work. 2. After a week or even 10 days because I am inside mostly and am not working hard, it was time to wash hair. Knowing that detergents work so very well I considered what was actually dirty. The hair itself picks up dust, and anything in the air. Your lungs pick up 10,000x more air than does your hair during that week. So how dirty is hair that's brushed a lot? I decided not very dirty. Checking my brush after each use I found hair and bits of dust and, probably, scalp. These were was darker at the end of 10 day period, but I WASHED MY BRUSH DAILY. than at day 1 after a shampoo. This is probably obvious but an important point. inventing a brush that cleaned hair, but that's not going to be told here. I decided not to shampoo twice because after testing how well one washing cleaned I decided one was enough. In fact I modified how I shampoo because 'really clean' is bad. We're cleaning a chemical system on your head that's supposed to supply oils to keep hair strong and flexible. Cleaning out the oils completely is as bad as running a car without oils. Something is going to break. Your hair is what gets dry without oils. Then it can break. Notice how your hair stretches when it's wet? It does so when it's 'oiled' also. The plan was to wash the scalp but not so much the hair. The hair is not dirty 'inside'. Just on the surface. Any liquid with detergent is going to rinse away surface dirt and oils. The plan is to use just enough shampoo to get the scalp cleaner than it was when you began. Getting the scalp clean but not so much that I removed all oils. Remember oils are OK.
to get it clean do you? And we really don't want our scalp squeaky clean. That's damaging and you can expect dry scalp and oil starved hair. Think of your scalp as two layers of oil. The top layer is dirty. The 2nd layer is clean. While this is not accurate it will help you wash it, in my opinion, correctly. If you over wash your scalp with detergent it can become dry. The idea is to move dirt, not oils, away from your scalp. I believe the hair is cleaned by the detergent rinse. Wet it at the top and put some detergent. A few drops around the top of the head is enough. Then brush back as far as you can keep the brush on scalp. Remember you're using a stiff and coarse brush so you'll feel the tips on your scalp. A plastic one with good tips is what I recommend. Once you feel you've moved the tips over all the scalp then move to the sides. It's different. You have to work at it but relax. Just move detergent on to the scalp with the brush tips. It's more of a wet, front to back, massage than anything else I can describe. Your hair is still in a pony tail so that you won't be faced with tangles. You won't need and, in my opinion, should not use a detangler or conditioner. Your scalp has what your hair needs. On the sides you work detergent into the scalp and brush it back with your hair. Obviously your hitting the pony tail at some point. And notice at this point you have not been scrubbing the hair itself. Focus on the scalp. When you remove the band and let your hair loose then simply comb, with the brush, from your scalp through your hair. The slipperiness helps. Don't add detergent to your hair. If you feel the need to put a bit on your scalp that's where it goes. Don't use a lot. Everyone's scalp is the same size. Six or sixty inches of hair? I believe the amount of detergent is within 20% of the same amount for both people. Their scalp is the target and the hair is cleaned with the rinse. ( see the tub if you don't believe that just having detergent in the liquid is enough to keep dirt from sticking). When you move the brush through all of the hair, without adding more detergent, I believe you're done. This liquid has oils, minor 'dirt' (skin) and water. smoke or whatever will be picked up and moved along. By taking time with your scalp and working the initial detergent and water your hair will be wet with the detergent solution. I've said this several times. My goal was is to keep as much oils on the hair. But still move dirt into the solution and finally, in the rinse, move it away. In fact I was able to grow my hair longer now because at 18 I used to wash it nearly daily. It would not grow past my shoulders. Since I retired, at 46, I've spent a lot of time researching projects I enjoy. This was one that I took as much time over as I did when I was paid $200 / hour for laboratory consulting. While I only have my 30 years experience and soft hair to prove my point the results are, in my opinion, good. I don't know how they could be better. I have over the years tried conditioners and fancy shampoo in expensive hotels. Just like naturally polished nails, I think, naturally healthy clean hair is simple when you have a plan. And simple is beautiful. (1) some choices I like are All or Purex non scented and no dye laundry detergents for this purpose.